There are other business card holders out there but we wanted to take it up a notch. Our solid wood card holders are either inlaid or overlaid with exotic veneers for beautiful decoration and sure to catch everyone's attention. They also come with two 1/8" earth magnets for the catch to hold the lid closed. The lid is notched on the end for easy opening. We use no dyes or stains, only the natural colors of the woods. 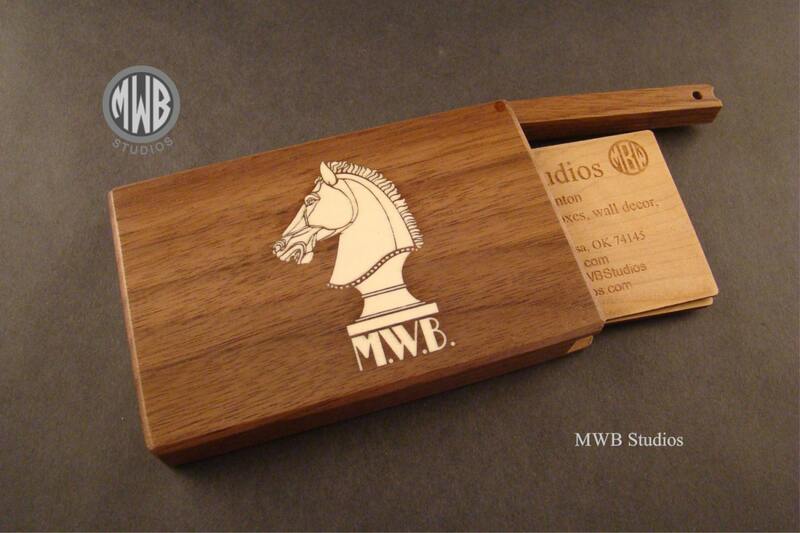 These business card holders make great gifts for colleagues for birthdays or the holidays. 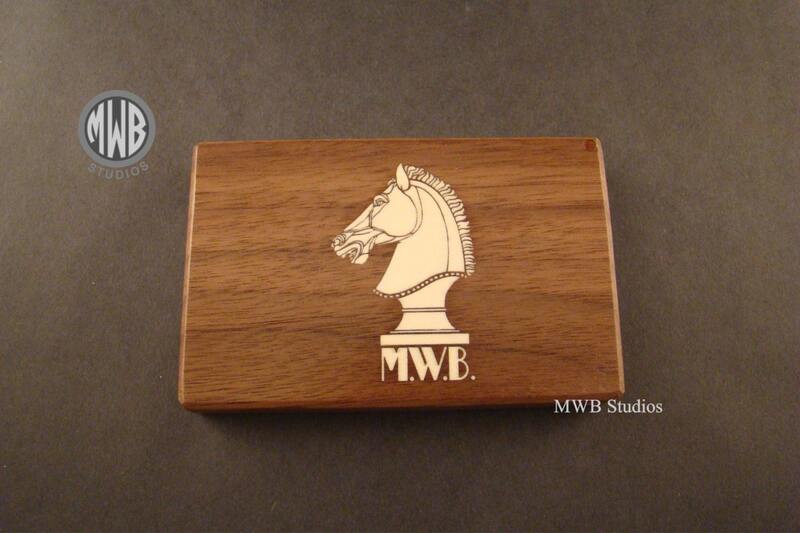 Get your company logo inlaid in the front and make sure everyone has one. They are also good for groomsmen's gifts or when you travel abroad on business, it's a great gift for the companies you visit. BCH5 is solid walnut inlaid with holly for the knight and initials. Your initials are included in the price. They measure 4-1/8" x 2-7/8" x 1/2" (105mm x 170mm x 13mm) and will hold 15 to 20 standard 2" x 3-1/2" business cards. They will also hold 4 to 5 standard 2-1/8" x 3-3/8" credit card and most drivers licenses. If you are familiar with our ring boxes we can also take any of the designs you see on a ring box and put it on a card holder for you or if you like and have a design of your own, contact us and we will be happy to work with you to put it on one of our cases. WOOD BUSINESS CARDS: If you are interested in purchasing some wood business cards like the ones pictured with the case, just let me know and I'll be happy to quote you. INITIALS: The price includes your initials inlaid under the Knight. SHIPPING: I normally ship the box via USPS first class mail which will take 3 to 5 days. If you need it sooner then I can ship priority mail which is 2 to 3 days and that will run $5.00 extra. If you need it overnight, that is express mail and it runs $28.00. Just contact me and let me know that is what you want to do or purchase the options linked below for the postage you require, otherwise it will go out first class. OVERSEAS SHIPPING: I do ship overseas to several countries but unfortunately not for free. The cost for first class international and the countries I ship to are listed with each item. If you do not see your country, contact me. Please allow 2 weeks for first class international, if you require it sooner, then contact me and I will quote you a price for expedited shipping. My products are priced for the U.S. market and does not include any duties for tariffs you may be required to pay by customs in your country. Express mail U.S. Market – use this link.